Rahu Kethu Transit is happening from January 30th 2016 Until 17th August 2017. Rahu is transiting from Virgo to Leo Rashi and Kethu is transiting from Pisces to Aquarius Rashi. Rahu Kethu rotates in anti-clockwise direction. In this special Occasion, Vedicfolks is performing a Special Rituals to bring good luck and fortunes to all the Rashis during this transit. 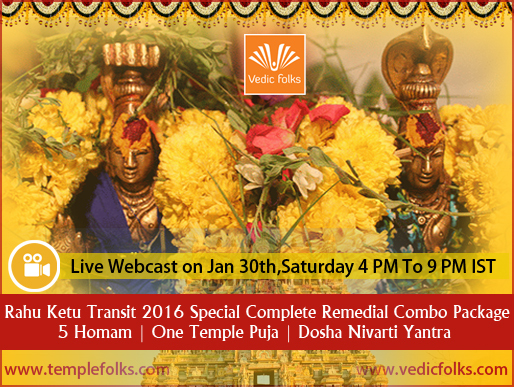 We perform following Vedicfolks rituals during this grand celebration along with temple pujas from templefolks. Ganesha Homam: Ancient Vedic texts describe Lord Ganesha as the destroyer of hindrances in life. It is believed that Lord Ganesha will fulfill the desires of his devotees when they offer prayers to him. Performing Ganesha homam will lead to several benefits in life by eliminating all types of obstacles. Durga Homam Remedy: According to ancient Vedic texts, Durga is considered as the supreme deity who fulfills the desires of her devotees whenever they face trouble in life. Worshipping and offering prayers to her will result in reducing the malefic effects of Lord Rahu in a horoscope. Also, this homam makes feasible ways for living a healthy, wealthy and prosperous life. Chinnamasta Devi Homam Anyone who performs Chinnamasta homam can witness major changes in life. Severe Rahu Doshas, Sun-Rahu Combustions, Planetary Eclipses doshas and major health issues will get dissolved at once by performing Chinnamasta homam. Dhumavathi Devi Homam: Main Remedy is to get complete remedy from Kethu Doshas and Mental illness. Dhumvathi homam rescues a person from all troubles in life. Anyone who wants to know the inner truths of life can perform this homam for attaining salvation. Moreover, it is possible to conquer over enemies with Dhumavati homam to ensure protection in life. Rahu Ketu Temple Puja - Thiruppampuram, Kumbakonam : Rahu Ketu Temple is situated 3 kms away from Karkaththi, a place westward of Kollumangudi on the kumbakonam - Kaaraikaal road. "The ancient scripture states that Rahu and Kethu worshipped the Lord and received his blessings in one body! Hence devotees who worship the Lord Ambal and Rahu - Kethu in this temple are rid of all their sins. They attain whatever they wish for! The sannadhi for Rahu - Kethu is situated in the north - east corner in a separate sannadhi. It is extremely beneficial to perform archanas and abhishekam in the rahu kaalam (the "rahu time" of the day) as these remove all evils and confer blessings. Rahu Kethu Dosha Nivarti Yantra: Rahu and Ketu are said to be the 2 snake Gods who evolved when the Lords churned the milky ocean. The head and the tail part of the snake are named as Rahu and Ketu respectively. When these snake planets overrule your birth chart or become a pitfall in your birth chart, all the success that has to reach you gets locked between these planets, thereby making failures common to you. When you want to appease these snake planets and get relieved of pains in life and make victory yours, praying to their Yantra will give you a great relief. They will make sure that all the pitfalls in your life are transformed to platforms of success. Relevant Rahu Ketu pooja or homa is conducted to instil their powers to a divine plate, which is then offered to you as the Rahu Ketu Yantra. Success in all endeavors, Financial/Business success, Debts will be reduced, New property acquisitions. We at Templefolks are proud to possess the most authoritative experts who have the knowledge and ease to invoke these powerful radiations which can bring exact results and all kind of fortunes in life!